Located in the grounds of Clachaig Inn, with magnificent views of the glen. Originally designed as a family home, Oak Tree Lodge offers spacious family accommodation and is fully equipped for your enjoyment of this ‘home away from home‘. Please note, especially our regular guests, that as from February 2017 Oak Tree Lodge provides bedroom accommodation by way of 1 double room, 1 twin bedded rooms and 1 single bedroom. For further reference, please see the floorplan in the image gallery below. See more about Oak Tree Lodge. Yet another wonderful stay at the Clachaig, Oak lodge was lovely, clean and tidy, if there was one thing I could say needed a little updating it was the kitchen, although functional it is a little tired, but other than that a fantastic week had by my family staying in all the lodges. As always we were well looked after by all the staff at the Clachaig and couldn’t have wished for better weather. This was our fourth stay at Oak Lodge. Just perfect for us and our Golden Retriever. Very comfortable accomodation in a perfect location surrounded by spectacular scenery. 100 yards from the dog friendly Clachaig Inn. Great food and great service. Going back with friends in November. Excellent. This was our second time staying in these lodges. In the grounds of the Clachaig Inn the setting and location are stunning. With easy drive to the mountain resort and just 40 minutes walk into the village along the path through the woods. The lodges have everything you need for a self catering stay in comfort. The beds are so comfy that we all had a great nights sleep. There were 4 adults,8 year old and dog and there is more than enough room. The double en-suite is huge with a further twin and a single all good in size. The family bathroom is lovely and the shower powerful. I went into the kitchen area one morning to see a huge stag peering into the lodge window ..what a wonderful start to the day.Already planning our next stay. Recently returned from yet another trip to Glencoe staying at the Clachaig in Oak chalet this time. Have stayed here on several occasions and have been in all of the different chalets at some time. These chalets appeal to us mainly because of their location which is awesome! They offer good accommodation are spacious well furnished comfortable and provide adequate equipment for self catering. To top it all you can have your dog staying with you! Mountaineering expedition 2019 "Axes & Pipes"
Another excellent visit. Everything we need for our annual winter mountaineering expedition is all here. A great location providing easy access to some of Scotland's finest mountains. Fort William a short drive away. Very comfortable accommodation with a two minute walk to the bar. Excellent food & selection of beers. Superb location to spend time with family, walking, drinking, eating and laughing. Only one concern we had was the oven in Oak and Beech Lodge on Christmas day gave some real challenges, not sure if demand effects the running but both ovens failed to operate properly at peak times and it took some creative swapping by both families to enable the dinner to be bought together. Cosy chalet in great location with stunninog views . And with the Clachaig inn on the doorstep what more could you want. Very well modernised apart from the kitchen . Although that does have an excellent washerdrier , fridge freezer and dishwasher so.perfectly functional. I cannot fault this accommodation or it's location. Oak Lodge was clean, spacious and had everything you need! The location is absolutely spot on, the views are amazing and great walks nearby. I would definitely recommend it to anyone. We went to Clachaig Inn for a couple of meals on an evening and the Inn itself is lovely. However, the only "OK" I've given in the review (whilst giving "Excellent" to everything else) is specifically related to Customer Service at the Inn and not the holiday accommodation itself. We found the girls working in the Inn to be lovely, chatty and overall very friendly. There was, however, one man working there who we all found to be very unwelcoming and rude. I don't think it was just us though - he seemed to have the same terrible attitude with other customers. Unfortunately he was there both on the Saturday & Monday evening (and was the same both times), so that did put us off somewhat. I do apologise though if Clachaig Holidays have no connection to Clachaig Inn - we had absolutely no issues with the accommodation side of things whatsoever - and we'd definitely come again! We enjoyed our stay so much that we booked again for next year in May and October. Will, as manager, and all his team were excellent hosts. Very happy with Oak Lodge. Well located for the walks we wanted to do. The lodge had all the facilities we could need and was very comfortable. Into issue that the gas fire didn’t work & we were unable to get it fixed, although the weather wasn’t too bad and the electric heaters in the rooms did the job. The Clachhaig Inn was handy for evenings where we didn’t want too cook & they were kind enough to let us reserve some tables for a large group to celebrate a birthday which went very well. We also enjoyed the live music. Everyone enjoyed their holiday & we would certainly book again. Although the weather was not great we went out everyday - walked up the Pap of Glencoe, not quite a Munro but not far off it. Great scenery at the top. Cycled to Holly Tree Hotel from the Lodge which can be done on the pavement and path as road very very busy. Enjoyed a few pints in the Boot Bar which always has a friendly buzz. Loved location, property we stayed in and food. Some staff could be a bit more polite towards paying customers. I’ve been here several times over the years and this is the first time I’ve had experiences of impolite staff. We had a lovely stay at Oak Lodge. It is in a beautiful quiet location, and the accommodation was very clean and comfortable, up to date, and had all we needed to cook. I wish we could have stayed longer than the three days we were there. Oak lodge is well equipped and well presented. It is right in the heart of the Glen and in the grounds of a fab pub. Great location for exploring the area. If travelling with older family members please note there is no hand rail on quite steep steps to main entrance. Care is needed. On arrival discovered that the gas fire was not working, reported, chap looked at it said it required an engineer to fix, no engineer visit and lt wasn't fixed by the end of our stay. Again on arrival the shower in the ensuite bathroom was taking forever to drain away, staff member then poured caustic soda down drain which cleared it, terrible smell of damp in ensuite, possibly due to lack of window. Sofa's and chairs in lounge area need replacing, old and uncomfortable, kitchen also require's updating. No designated parking for lodge clients,staff in habit of parking their cars there, made getting parked a bit difficult at times. Could only get BBC1 & 2 on TV, no others channels, mostly due to location, also no wi-fi in lodge, no booster routers which would help, wi-fi in main hotel poor and very slow. Dear Mr Taylor, The local gas engineer looked at the fire and told us it requires new parts but as it is the middle of summer I am afraid this hasn't been a priority. We have had no issue with damp in the en suite shower room so we are unsure why you could smell damp during your stay. The sofas and kitchen were not upgraded when the rest of the lodge was as it was believed they did not need to be. It is the first time we have had a complaint I am aware of on either of these things, usually people are commenting how comfortable Oak is. 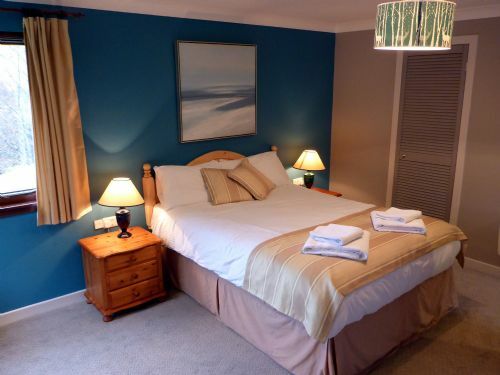 There is a large car park which is shared by the self catering properties and live in staff, you can also park right outside the single room next to the front door of Oak as many guests do. If by chance this car park was full we have further parking for around 70 vehicles. The lack of TV channels is due to a local mast transceiver not working properly and is completely out of our control. With regards to the Wi-Fi as we state on our website for Oak Lodge "Free Wi-Fi is provided at the Inn, though the service is limited due to the rural mountain location." Due to our location our internet bandwidth is not strong enough to boost the signal beyond the router we have tried this and there is currently no other option to us as a business which is very frustrating. We hope this experience has not put you off staying with us again in the future. Our sixth time back (and have stayed in hotel, lodge and chalets) this one has been nicely refurbished and has plenty of room. Oak lodge was like home from home. All the facilities were everything you would wish for. The location is hard to beat especially if you’re a climber or simply happy sitting in the chairs outside taking in some of the best scenery in the UK. Great local beer and food menu in the Clagaic bars 1 minute walk away. Haggis Neeps n Tatties a must. If you’re lucky like we were, you might see a Pine Martin that looked at us outside the lounge window! This cabin is in the most perfect location (almost), looking at the towering mountains of Glencoe and within yards of the Clachaig, the perfect pub. The cabin is well equipped, clean and comfortable. The kitchen and eating area was fine but we ate in the Clachaig every evening. The only drawback was the proximity of the septic tank, at times the smell prohibited sitting out to enjoy the view. Nevertheless a great place to stay. We enjoyed our stay in Oak Lodge. From the outside it doesn't look much. Inside it was very good. The bedrooms and new bathrooms were clean and modern. The lodge was decorated tastefully. Our negative was the cooker which only worked on full , the oven doesn't reach the highest temperatures. The kitchen units need to be replaced to bring the whole lodge up to the same standard. We stopped going into the hotel back bar due to variable opening hours and slow service. The garden has all day sunshine, we made good use of the garden chairs. Been before and will be coming back. Sounds like you had a good one. Hope to welcome you back again sometime soon. This was our fourth time staying in the Clachaig lodges. Twice in Beech and twice in Oak. We had family staying in Beech and Rowan and there was a total of thirteen. Glen Coe is the most beautiful place to stay and so much in the surrounding area to see. and do. Some of the family tried skiing at the Glen Coe Ski resort, cycling and canoeing along the Caledonian canal. Segway at Ballachulish, ice wall climbing at Kinlochleven, a rib ride from Siel. There was much walking, Glen Nevis and the awesome Steall Falls, in Glen Coe itself Glen Etive and our go to place the lovely Lochan near the village. We were so lucky to see so much snow still on the tops but also lovely weather for all our activities.So much was packed into a very short week. The big meet at the end of each day was the wonderful Boots Bar great entertainment and hospitality, and visits from the local deer, Cant wait for the next time and would recommend this place to all, something for everyone. Comfortable spacious accommodation in idyllic location. Regular visitor to Clachaig. Never disappointed. First time in Oak Tree Lodge. Well impressed. Very well appointed with all that is required for a comfortable stay. Decor and layout clean and modern. Good quality appliances. Heating very good particularly for Winter. The views from the Lodge are absolutely stunning. Although perfect for a self catering holiday, the proximity of the hotel bars provide an excellent dining service facilitating long days in the hills without having to cook. Meals are good quality and the choice is excellent. The boots Bar provides a relaxed friendly atmosphere where you can reflect on the days activities by a warm fire with a few drinks (and your dog is welcome too). Customer service throughout is friendly and welcoming. Only negative is the lack of internet. Have already booked three further stays for this year. Can't argue with that. Many thanks for the feedback and we look forward to seeing you later in the season. We're working on that internet thing, but it's taking time as it's complicated given that BT don't want to know.